State weather bureau PAGASA provides the latest news updates on Typhoon Paeng. Read the weather forecast for November 4, 2014 on this page. Paeng has maintained its strength as it continues to move Northeastward over the Philippine Sea, weather forecasters reported. 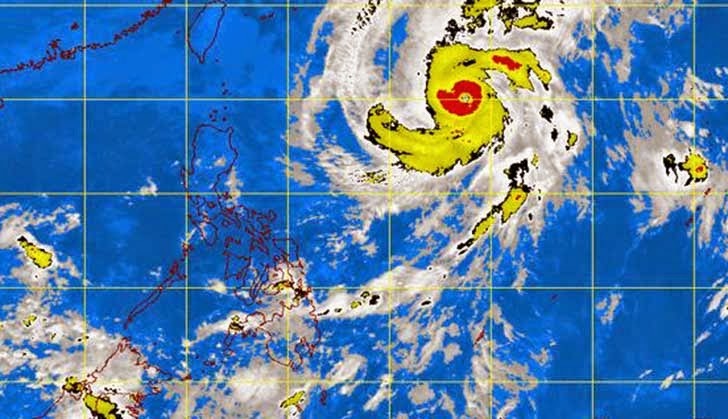 At 10 p.m. Monday, the typhoon's eye was spotted at 1,285 kilometers East Northeast of Calayan, Cagayan or 1,225 km East of Basco, Batanes with maximum sustained winds of 205 kilometers per hour near the center and gustiness of up to 240 kph. It is forecast to move Northeast at 15 kph. Bagyong Paeng is expected to be outside the Philippine Area of Responsibility (PAR) by Tuesday afternoon and 1,450 km East Northeast of Itbayat, Batanes in the evening. Estimated rainfall amount is from 7.5 to 30 millimeters per hour (heavy to intense) within the 700-km diameter of said typhoon. The weather agency said Typhoon Paeng will continue to enhance the northeasterly winds over the northern and eastern seaboards of Luzon and over the eastern seaboard of Visayas resulting to rough to very rough sea conditions over the aforementioned areas. Fisherfolks and those using small seacrafts have been advised not to venture out over the aforementioned seaboards, PAGASA added.